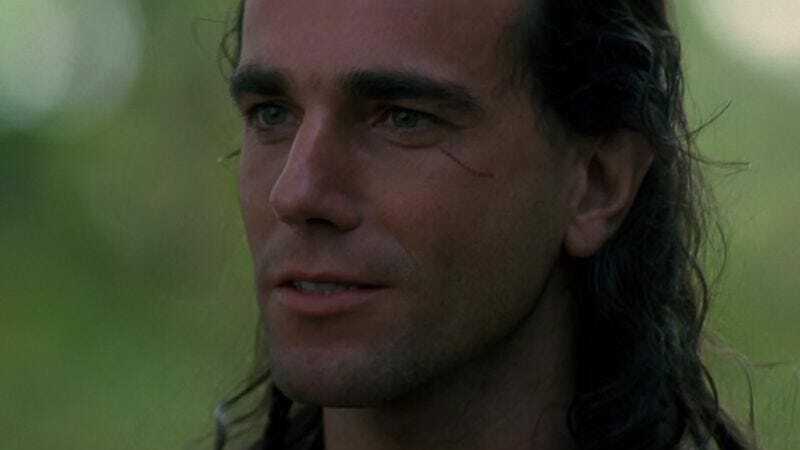 Michael Mann’s interest in men at work and Daniel Day-Lewis’s career-long project to retell the history of the United States intersect in The Last Of The Mohicans, a 1992 adaptation of the James Fenimore Cooper novel that’s also a credited remake of the 1936 film version. Day-Lewis plays Hawkeye, a white man adopted by the Mohican tribe in upstate New York, caught between sides during the French And Indian War in 1757. Hawkeye, his brother Uncas (Eric Schweig), and their father Chingachgook (Russell Means) save Cora Munro (Madeleine Stowe), the daughter of a British soldier, from an attack by the Huron, and form an uneasy and extremely temporary alliance with the British against the attacking French. The Mohicans’ position (concerned more with protecting their friends and family) allows Mann to portray an armed conflict where neither warring side is particularly worth rooting for—and he nonetheless features a memorable villain in Magua (Wes Studi), as ruthless and avaricious on his people’s behalf as Hawkeye, Uncas, and Chingachgook are protective on theirs. Made well before Mann’s fascinating switch to (and command of) digital cinematography, Mohicans is one of his lushest films; it juxtaposes beautiful green scenery with the ferocious immediacy of several battle scenes. These elements are combined via a signature recurring image of Day-Lewis, back slightly hunched with purpose, running and leaping through the brush. Being a Mann film, Mohicans takes place predominately at night, with beautiful images of cannons and gunfire lighting up the dark sky, making it look as if “the whole world is on fire,” as Cora says. It’s Mann’s second of five collaborations with cinematographer Dante Spinotti, who would go on to shoot Heat, The Insider, and Public Enemies. Day-Lewis is typically excellent in an atypical movie-star role, and he maintains a respectful heat opposite Stowe. There’s too much plot for them to have many long talks, so their relationship develops in more visual terms, most memorably in a passionate embrace behind a waterfall followed by that famous declaration, a romantic pledge as marching orders: “You stay alive, no matter what occurs! I will find you!” It’s one of the most romantic scenes in Mann’s filmography (even if that romance is, in fact, defined principally through a series of passionate embraces). The director seems awed by the occasional presence of honor in this new world, but he doesn’t fetishize it. Availability: The Last Of The Mohicans is available on DVD and Blu-ray, most commonly in a “director’s definitive cut” that runs a couple of minutes longer than the theatrical cut; it’s available from Netflix or your local video store/library. The film can also be rented or purchased from the major digital outlets.